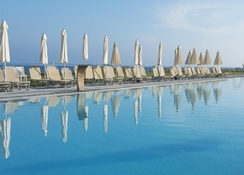 An all-inclusive hotel with 4-star amenities, Louis Phaethon Beach is a charming family holiday property located on Yeroskipou Beach in Paphos, Cyprus. It's also popular among couples, honeymooners and solo travellers because of the fantastic facilities and services on offer. Nestled amid lush gardens, the hotel features spacious guestrooms with balconies offering sea or inland views, two restaurants, three bars with one by the pool, a family waterpark, children’s club, on-site waterpark, three outdoor and indoor swimming pools, Jacuzzi, spa, fitness centre and bundles of activities and entertainment. 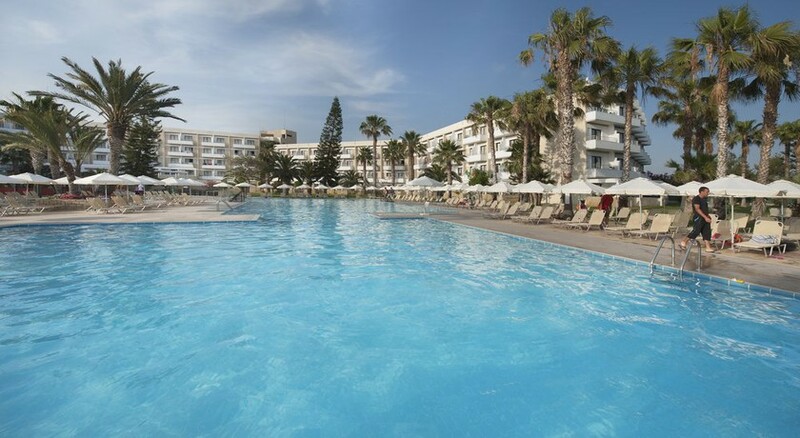 This multi-awarded beach club hotel ensures complete enjoyment for all its guests, with an array of indoor and outdoor sports and leisure facilities for all ages on offer, too – making it a hot spot to stay for sunny holidays in Cyprus. 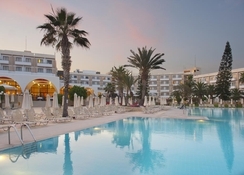 Louis Phaethon Beach hotel is conveniently located on Yeroskipou Beach in Paphos. The beach is barely a one minute walk from the premises, while the nearest shopping mall is situated 500 metres away. It takes about 5 minutes to reach the town centre, which has numerous restaurants, bars and shops. 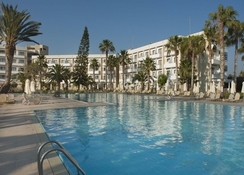 The Paphos port is 3 km away and the Paphos International Airport is 10 km from the hotel. The spacious and modern guestrooms at Louis Phaethon Beach hotel are categorised into Double Rooms (2+1 guests) and Family Rooms (2+2 guests), all built overlooking the beautiful blue sea or lush gardens. They come fitted with light wood furniture, pastel colours and laminate flooring that lend the rooms a cheerful ambience. Each room has its own private balcony or terrace. Standard amenities include en-suite bathroom with shower, bath amenities, TV with satellite channels, fridge, telephone, safety deposit box (extra charges), air conditioning and heating system. Louis Phaethon Beach Paphos is a gastronomic delight offering two restaurants and three bars. Its main restaurant, The Esperides, serves Cypriot and international cuisines for breakfast, lunch and dinner in buffet style, with both indoor and outdoor seating available. The China Spices restaurant (open only in summer) is an outdoor joint offering delicious Asian cuisine. There are often themed nights with Italian, Greek, Cypriot or seafood specialties, which is included in the hotel's half-board and all-inclusive packages. Atrium Bar, the hotel’s main bar, stocks daytime refreshments and evening cocktails, while the poolside bar and restaurant is a comfortable place to enjoy hot and cold snacks, cocktails, beer and soft drinks till evening. Cafe Vienna is a delightful coffee shop serving hot and cold drinks, pastries and cakes. There are four swimming pools within the hotel complex: two large outdoor pools, a heated indoor pool and a children’s pool. Parasols and loungers are complimentary facilities, and there’s around 2000 sq. metres of paved sunbathing area. 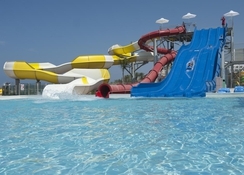 Loads of games and activities are conducted in and around the children’s pool throughout the day. 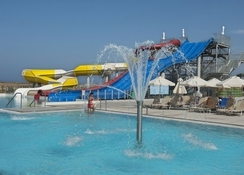 The hotel also boasts an in-house waterpark that is fitted with six waterslides and other fun rides. Guests can indulge in a number of sports and activities such as tennis, basketball, archery, beach volleyball, table tennis, billiards, bowling, as well as electronic games, aerobics and ballroom dancing. There’s a fitness room, indoor Jacuzzi, steam room, sauna and a wellness centre for beauty treatments and massages. In the evening, Louis Phaethon Beach hosts live entertainment, shows and the Chariots Night Club where you can dance the night away to disco music. The little ones are pampered at the hotel with bundles to do. They have their own buffet, their own swimming pool and a kids’ club where workshops, activities and games are conducted.